Near Space Corporation (NSC) launched its first balloon flight with the NASA Flight Opportunities Program on Sunday January 20th. NSC has completed more than 160 balloon flights since it began operating from Tillamook, Oregon in 1996. This was the first balloon launch with the NASA Flight Opportunities Program. NSC worked with a research team from the New Mexico Institute Of Mining And Technology (NMT) to launch their scientific payload to just over 20 miles above the earth’s surface. The Principal Investigator, Dr. Andrei Zagrai, has worked with his team for several months to develop their payload, the Structural Health Monitoring System for commercial spacecrafts. This payload and associated research has been sponsored by the FAA Office of Commercial Space Transportation through its Commercial Space Transportation Center of Excellence with contributions from AFRL Space Vehicles and New Mexico Tech. Hardware components were provided by Metis Design, LORD Microstrain, and Los Alamos National Laboratory. The system is designed to monitor the structural integrity of space vehicles and is an important element in maintaining their safety throughout their system lifecycle. This particular flight tested the NMT sensors and wireless communications equipment at high altitude which closely simulates a space- like environment. This is a crucial step in developing sensors and related systems that can be integrated into space vehicles to alert operators when structural integrity has been compromised or degraded. 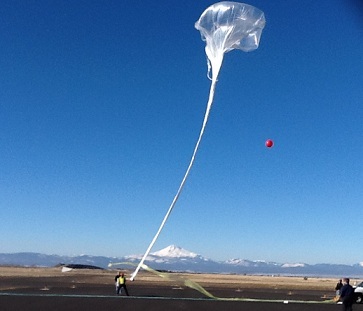 The balloon was launched on Sunday January 20 around noon from Madras, Oregon. The balloon ascended to an altitude of 108,000 feet and the NMT payload was deployed. Following a 2 hour data collection period, the balloon flight was terminated and the payload floated back to earth using a recovery parachute. The Structural Health Monitoring system was able to successfully collect important data which will be used for further analysis and research. NASA Flight Opportunities Program has a multi-year contract with NSC to provide commercial balloon flights. NSC has completed more than 160 balloon flights since it began operating from Tillamook, Oregon in 1996. Its management team has more than 75 years of combined experience designing, building, and operating high altitude balloons. This includes the creation of a wide variety of platforms to support Earth atmospheric research, space technology development, and planetary exploration missions. The company specializes in providing affordable solutions to NASA, NOAA, DOD, and commercial aerospace customers. In addition to its Tillamook facility, NSC also maintains launch sites in Madras, Oregon and South Point, Hawaii. The goal of NASA’s Flight Opportunities Program is to develop and provide opportunities using commercially available platforms for space technologies to be demonstrated and validated in relevant environments. These technologies are expected to benefit NASA and other government agencies, U.S. commercial industries, and the public. Visit https://flightopportunities.nasa.gov for more information.